The Avigilon H4 IR PTZ camera line combines patented Avigilon self-learning video analytics with zoomable infrared (IR) technology to provide broad coverage and exceptional image quality in a range of lighting conditions and environments. With its powerful zoom lens and IR technology, users can see up to 250 metres (820 feet) in complete darkness. The camera’s IR projection angle and distance automatically adjust based on camera zoom lens movement, ensuring the scene is illuminated consistently across the field of view for high-quality, detailed images. 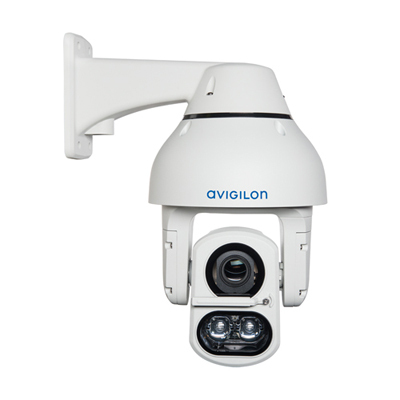 Available in 1.3 and 2 megapixel (MP) camera resolutions, the Avigilon H4 IR PTZ features continuous 360-degree rotation, enabling operators to more easily zoom in and out to capture and monitor activity in almost any direction. Choose from 45x zoom (1.3 MP) and 30x zoom (2 MP) lens options based on site requirements. With a built in wiper, the H4 IR PTZ keeps the window surface clear of moisture and offers a rugged housing design for tough environments, making it well suited for a wide range of weather applications.